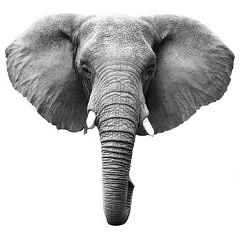 I am still seeing considerable confusion, misunderstanding and misreporting around what can and what cannot be determined from the public version of the ICD-11 Beta drafting platform on emerging proposals for revision of ICD-10′s Somatoform disorders. If writing about complex classificatory revision processes, I suggest you first familiarize yourselves with how the several ICD-11 Beta drafting platform linearizations function and interrelate; that you inform yourselves about the proposals of both of the ICD-11 working groups charged with making recommendations for potential revision of the ICD-10 Somatoform disorders, including obtaining and scrutinizing key journal papers, reports and presentations on emerging proposals published by members of both working groups; and that for comparison, you have an understanding of the existing F45 Somatoform disorders framework and the disorder descriptions and criteria for the categories located under this section of ICD-10, and that you are also familiar with the construct and criteria for DSM-5’s Somatic symptom disorder, in order that you can provide evidence based, accurate and up to date information and analysis, within the limitations of what information is public domain. It has become clear to me, down the years, that the majority of ME patients are not interested in evidence based reporting. I am wasting my time. For those who have listened, thank you. The site will remain online as a resource. Update at March 16, 2014: I am advised that Justice For Karina Hansen on Facebook has added a note of correction to its Facebook post. I am still seeing considerable confusion, misunderstanding and misreporting around what can and what cannot be determined from the public version of the ICD-11 Beta drafting platform on emerging proposals for revision of ICD-10’s Somatoform disorders. The term Bodily distress syndrome does not appear in the public version of the ICD-11 Beta drafting platform. The term entered into the Beta draft is Bodily distress disorder. Bodily distress disorder did not appear in the Beta draft on January 29. It was entered into the draft, two years ago, in February 2012. January 29 is the date on which I reported that an ICD-11 “Short Definition” had recently been inserted for the (long-standing) entry for a proposed Bodily distress disorder category. If you have already written about proposals for the revision of the Somatoform disorders in the context of the ICD-11 Beta drafting platform or if you are planning to write, please read this post. If writing about complex classificatory revision processes, I suggest you first familiarize yourself with how the several ICD-11 Beta drafting platform linearizations function and interrelate; that you inform yourself about the proposals of both ICD-11 working groups charged with making recommendations for potential revision of the ICD-10 Somatoform disorders, including obtaining and scrutinizing key journal papers, reports or presentations on emerging proposals published by members of both working groups; and that for comparison, you have an understanding of the existing F45 Somatoform disorders framework and the disorder descriptions and criteria for categories located within this section of ICD-10, in order that you can provide evidenced based, accurate and up to date information and analysis, within the limitations of what information is public domain. Please note that it is not within the scope of this post to review or discuss the implications for retaining the ICD-10 status quo for ICD-11, or for adopting SSD-like or BDS-like constructs (or any variations on all three) – but to set out what can and what cannot safely be determined from the Beta draft and associated literature. • In September, Oye Gureje, who chairs the ICD-11 Expert Working Group on Somatic Distress and Dissociative Disorders, will be presenting on “Proposals and evidence for the ICD-11 classification of Bodily Distress Disorders” as part of a series of ICD-11 Symposia at the World Psychiatric Association’s XVI World Congress, in Madrid. The ICD-11 Expert Working Group on Somatic Distress and Dissociative Disorders (S3DWG). • In 2012, the PCCG published a paper proposing a new disorder construct to replace ICD-10-PHC’s F45 “Unexplained somatic symptoms/medically unexplained symptoms” which the group proposed to call Bodily stress syndrome (BSS) . F48 Neurasthenia was also proposed to be eliminated for the ICD-11-PHC. So the PCCG group were proposing the use of a new term, Body [sic] distress disorders, as a disorder group name for a number of unrelated ICD-11-PHC primary care disorders, whilst proposing the term Bodily stress syndrome as a new ICD-11-PHC disorder category listed under that group. • In 2012, the PCCG’s tentative new BSS disorder drew heavily on Fink et al’s Bodily Distress Syndrome’s (BDS) construct and criteria. Based on physical symptom clusters or patterns from various body systems and (theoretically) on the autonomic arousal or “over-arousal” illness model. But the tentative BSS criteria also featured some DSM-5 SSD-like psychobehavioural characteristics, which do not form part of Fink et al’s BDS criteria. There were other, minor criteria discrepancies between BSS and BDS. • In 2012, the second working group, the S3DWG, also published a paper presenting a new disorder construct which they proposed to call Bodily distress disorder (BDD) . Again, a similar term to one already in use. The S3DWG group proposed to subsume all of the ICD-10 Somatoform disorders categories of F45.0 – F45.9, plus F48.0 Neurasthenia, under a new, single BDD disorder category, with a number of severity specifiers (initially, Mild, Moderate and Severe). • But the S3DWG’s emerging BDD construct was quite different to the PCCG group’s BSS. It was characterized by a simplified criteria set based on excessive preoccupation and psychobehavioural responses to single or multiple, non specific bodily symptoms. The BDD construct shared characteristics with DSM-5’s Somatic symptom disorder (SSD) – not with Fink et al’s BDS. • In common with DSM-5’s SSD, the BDD diagnosis eliminated the “unreliable assumption of causality” and did not exclude the presence of a co-occurring physical health condition. BDD, as described in the 2012 Gureje, Creed paper, and Fink et al’s BDS are divergent constructs. • So by late 2012, there were two sets of recommendations – BSS, drawing heavily on Fink’s BDS model, but with a nod towards DSM-5’s SSD, and BDD – with notable similarity to DSM-5’s SSD. • In early 2012, the disorder name entered into the ICD-11 Beta drafting platform was Bodily distress disorder, (not Bodily stress syndrome or Bodily Distress Syndrome). No Definition for BDD was added at the time. • In early 2014, a Definition for Bodily distress disorder was inserted into the Beta drafting platform. The Definition wording was drawn from the Gureje, Creed (S3DWG) 2012 BDD paper, which had described an SSD-like disorder construct. From the limited content displaying in the Beta draft, it simply isn’t possible to determine that BDD, in the context of ICD-11 Beta draft usage, is being defined as a Fink et al BDS-like disorder construct. • An additional layer of complexity: recently, the BDD severity specifier “Severe bodily distress disorder” has been removed from the draft and ICD-10’s Somatization disorder reinserted. Neurasthenia, previously proposed by both groups to be eliminated or subsumed for ICD-11, has also been inserted back into the Mental and behavioural disorders chapter, which is (currently numbered Chapter 06). The Definition assigned to Somatization disorder remains unrevised from legacy text recently imported, unedited, from ICD-10. It is currently unclear how Somatization disorder and Neurasthenia are now intended to integrate within the core ICD-11 and the ICD-11 Primary Care framework, given that a new, single disorder construct had earlier been proposed by both groups to subsume Somatization disorder and all of the ICD-10 Somatoform Disorders categories between F45.0 – F45.9, and to subsume F48.0 Neurasthenia. • The development of a replacement for the ICD-10 Somatoform Disorders is a work in progress and proposals may go through several iterations over the next two or three years. The two groups may or may not be striving to reach consensus. The construct favoured by ICD-11 Revision Steering Group may or may not be the construct that is put out for initial field testing. • Without full disorder descriptions, criteria, inclusions, exclusions, differential diagnoses etc, there is currently insufficient content in the Beta drafting platform to determine the precise nature of whatever construct and criteria is currently favoured by ICD-11 Revision Steering Group; or whether the two groups have reached consensus over a new disorder name and concept; or whether and to what extent the groups’ two (divergent) constructs have been revised since publication of their respective 2012 papers. Possibly the ICD-11 Symposium IV presentation, later this year, in Madrid, may elucidate. If there is a transcript, summary report or presentation slides of Dr Oye Gureje’s presentation to the World Psychiatric Association XVI World Congress in September, I will post presentation materials, when available. There are some additional notes below the WPA XVI World Congress details. The World Psychiatric Association’s XVI World Congress of Psychiatry will be held in Madrid, on September 14–18, 2014. The 12 member PCCG leads the development and field testing of the revision of all 28 mental and behavioural disorders proposed for inclusion in the next ICD primary care classification (ICD-11-PHC), an abridged version of the core ICD-11 classification. Per Fink’s colleague, Marianne Rosendal, is a member of the PCCG group. The members of the PCCG are: SWC Chan, AC Dowell, S Fortes, L Gask, D Goldberg (Chair), KS Jacob, M Klinkman (Vice Chair), TP Lam, JK Mbatia, FA Minhas, G Reed, and M Rosendal. New disorders that survive the primary care field tests must have an equivalent disorder in the main ICD-11 classification. The second sub working group advising on the revision of ICD-10’s Somatoform Disorders is the 17 member Expert Working Group on Somatic Distress and Dissociative Disorders (S3DWG). The S3DWG is chaired by Prof Oye Gureje. DSM-5 Somatic Symptom Disorder (SSD) work group member, Prof Francis Creed, is a member of this group. Other than Athula Sumathipala, MD, PhD (UK) and Joan E. Broderick, PhD (Stony Brook University, NY) all other members of this sub working group have yet to be identified. Their names are not listed in the Gureje, Creed 2012 paper  and a list of members is not available from the ICD Revision website. The term entered into the Beta draft is Bodily distress disorder not Bodily stress syndrome or Bodily Distress Syndrome. Bodily distress disorder is characterized by high levels of preoccupation regarding bodily symptoms, unusually frequent or persistent medical help-seeking, and avoidance of normal activities for fear of damaging the body. These features are sufficiently persistent and distressing to lead to impairment in personal, family, social, educational, occupational or other important areas of functioning. The most common symptoms include pain (including musculoskeletal and chest pains, backache, headaches), fatigue, gastrointestinal symptoms, and respiratory symptoms, although patients may be preoccupied with any bodily symptoms. Bodily distress disorder most commonly involves multiple bodily symptoms, though some cases involve a single very bothersome symptom (usually pain or fatigue). This BDD Definition wording is based – in some places verbatim – on the construct descriptions presented in the Gureje, Creed (S3DWG) “Emerging themes…” paper, published in late 2012 . Unfortunately this journal paper remains behind a paywall but I do have a copy. “…At the time of preparing this review, a major highlight of the proposals of the S3DWG for the revision of the ICD-10 somatoform disorders is that of subsuming all of the ICD-10 categories of F45.0 – F45.9 and F48.0 under a single category with a new name of ‘bodily distress disorder’ (BDD). 2. The bodily symptom(s) or fears about illness are distressing and are associated with impairment of functioning. This is not a BDS model – it’s a disorder framework into which DSM-5’s “Somatic Symptom Disorder” (SSD) could comfortably be integrated, thus smoothing harmonization between ICD-11 and DSM-5. As with DSM-5’s SSD, the focus was not on the number of symptoms, or on symptom patterns or clusters from one or more body systems, or whether symptoms were determined as “medically explained” or “medically unexplained” or of undetermined aetiology, but on the perception of “disproportionate” and “maladaptive” responses to, or “excessive” preoccupation with any troublesome chronic bodily symptom(s). So in 2012, the two groups lacked agreement not only over what to call any new, single disorder replacement for ICD-10’s Somatoform disorders, but also on what disorder construct and criteria should be recommended to ICD Revision. Given that the wording of the Definition for Bodily distress disorder as entered into the draft, in January, is based on text from the Gureje, Creed 2012 paper, which had described an SSD-like construct, one might argue that the disorder name and Definition currently displaying in the draft potentially better describes an SSD-like construct – not Fink et al’s BDS. And with the recent reintroduction into the Beta drafting platform of Somatization disorder and Neurasthenia, one might further argue that there is perhaps a recent consideration for a construct that doesn’t veer too far away from the status quo, which could be moulded to accommodate selected of the ICD-10 legacy Somatoform disorders categories, but which removes the requirement for symptoms to be “medically unexplained” in order that SSD might be shoehorned into an ICD-11 framework for “harmonization” with DSM-5. But at the moment and in the absence of documentary evidence or clarification by WHO/ICD Revision, what cannot safely be said is that in the context of ICD-11 usage, Bodily distress disorder equates with Fink et al’s Bodily Distress Syndrome. Caveats: The ICD-11 Beta drafting platform is not a static document: as a work in progress over the next two to three years, it is subject to daily edits and revisions, to field test evaluation and to approval by Topic Advisory Group (TAG) Managing Editors, ICD Revision Steering Group and WHO classification experts. 1. Lam TP, Goldberg DP, Dowell AC, Fortes S, Mbatia JK, Minhas FA, Klinkman MS: Proposed new diagnoses of anxious depression and bodily stress syndrome in ICD-11-PHC: an international focus group study. Fam Pract Feb 2013 [Epub ahead of print July 2012]. Caveat: The ICD-11 Beta drafting platform is not a static document: it is a work in progress, subject to daily edits and revisions, to field test evaluation and to approval by Topic Advisory Group Managing Editors, the ICD Revision Steering Group and WHO classification experts. Since the release of the initial iCAT drafting platform, in 2010, the Somatoform disorders section of Chapter 05 has undergone numerous iterations. In the Foundation Component, the severity specifier, Severe bodily distress disorder, has now been removed. ICD-10’s Somatization disorder has been reinserted as a child category under Bodily distress disorder. The term Bodily distress disorder is cross referenced to ICD-10 F45 Somatoform disorders. Somatoform disorders is listed under Synonyms to Bodily distress disorder. Note: these psychobehavioural responses that characterize the disorder are based on text in the 2012 Creed and Gureje paper on emerging proposals for Bodily distress disorder . That paper also says that in doing away with the “unreliable assumption of its causality” the diagnosis of BDD does not exclude the presence of a co-occurring physical health condition – which describes a disorder framework into which DSM-5′s “Somatic Symptom Disorder” (SSD) would be capable of integration, allowing harmonization between ICD-11 and DSM-5. The Exclusions listed under Bodily distress disorder are legacy terms imported from ICD-10’s Somatoform disorders section. Hypochondriasis has also been inserted as an Exclusion to Bodily distress disorder. you’ll see that the Definition that has been reinserted is legacy text imported from ICD-10’s F45.0 Somatization disorder. Note: there is no Undifferentiated somatoform disorder listed in the ICD-11 Beta draft. I cannot confirm whether ICD-11 Revision also intends to reinsert Undifferentiated somatoform disorder to the ICD-11 Beta draft, or whether this represents an oversight on the part of the Beta draft Managing editors to edit the text that has been imported from ICD-10 to accord with ICD-11 proposals. “show/hide availability in main linearizations”. Click on the button and coloured tags will display at the beginning of each category term which indicate the availability of that term within the various linearizations. For example, hovering over the colour tags for Bodily distress disorder indicates that this Foundation Component term is available in “In Mortality and Morbidity, Primary Care High Resource, Primary Care Low Resource” linearizations. A further change – Neurasthenia has also been reinserted into the Beta draft! Neurasthenia has also been proposed to be eliminated from the Primary Care version (ICD-11-PHC), according to the 2012 proposals of the Primary Care Consultation Group, but now its back in the draft and listed for Foundation Component, Primary Care High Resource and Primary Care Low Resource linearizations (but not Mortality and Morbidity). The Long Content Model Definition that displays in the disorder description pane is the legacy F48.0 text unmodified from ICD-10. ICD-10 G93.3 category, postviral fatigue syndrome, remains listed as an Exclusion to Neurasthenia, as it does in ICD-10. So what are the implications? Without clarifications from ICD Revision it cannot be determined from what displays in the public version of the Beta draft what the current intentions are, or how these revised proposals would accommodate the restoration of Somatization disorder and Neurasthenia within the BDD framework (at least as the BDD framework stood in the 2012 Creed and Gureje emerging proposals paper). • that a child category, Somatization disorder, which was previously one of a handful of SDs proposed to be replaced by a single new BDD category, has now been reinserted for the Foundation Component, Mortality and Morbidity, Primary Care High Resource and Primary Care Low Resource linearizations, with its Definition text unmodified from ICD-10. • that currently, the Definition text for Somatization disorder is unmodified from ICD-10 and includes an unexplained reference to F45.1 Undifferentiated somatoform disorder*. • that Severe bodily distress disorder is no longer listed in any linearization, at least in the public version of the Beta drafting platform. • that Neurasthenia, which was previously proposed to be eliminated for both the core and primary care versions, is now back in the Beta draft for Foundation Component, Primary Care High Resource and Primary Care Low Resource linearizations, with its Definition text unmodified from ICD-10. *In DSM-5, Somatic symptom disorder is cross-walked to ICD-10-CM F45.1 Undifferentiated somatoform disorder. NCHS/CMS has proposed to insert the term Somatic symptom disorder into ICD-10-CM as an Inclusion to F45.1 Undifferentiated somatoform disorder. has been reverted by ICD-11 Revision to read, “Bodily distress disorders”. “Bodily distress disorders, and psychological and behavioural factors associated with disorders or diseases classified elsewhere”. Note that the Definition and Inclusions for “5C70 Psychological and behavioural factors associated with disorders or diseases classified elsewhere” are legacy text carried over from ICD-10. The Fxx codes listed under “Exclusions” for this category have not yet been updated to reflect the new ICD-11 coding structure. A change also for Hypochondriasis – which has also been removed from under parent class, Bodily distress disorders, and is currently assigned dual parentage under: Obsessive-compulsive and related disorders; and Anxiety and fear-related disorders. This means that the only categories currently coded under parent term “Bodily distress disorders” (previously, “Bodily distress disorders, and psychological and behavioural factors associated with disorders or diseases classified elsewhere”) are “Bodily distress disorder” and “Severe bodily distress disorder“. In June 2013, Prof David Goldberg co-authored a paper: Bodily distress syndrome (BDS): the evolution from medically unexplained symptoms (MUS) in Mental Health in Family Medicine. Co-author, Gabriel Ivbijaro, is Editor in Chief, Mental Health in Family Medicine and a past Chair of the Wonca Working Party on Mental Health. Mental Health in Family Medicine is the official journal of The World Organization of Family Doctors (Wonca) Working Party on Mental Health. I don’t have access to this paper, which is currently embargoed, but it should be free in PMC on June 1, 2014 . A definition for “Bodily distress disorder” has very recently been entered into the public version of the ICD-11 Beta drafting platform by ICD-11 Revision. Only the ICD-11 Short (100 word) Definition for this proposed new ICD category has been inserted. At this point, no Inclusion Terms, Exclusions, Synonyms, Narrower Terms, Diagnostic Criteria or other potential Content Model descriptors have been populated. The 12 member Primary Care Consultation Group (PCCG) leads the development and field testing of the revision of all 28 mental and behavioural disorders for inclusion in the next ICD primary care classification (ICD-11-PHC), an abridged version of the core ICD classification. The PCCG is chaired by Prof Sir David Goldberg. Per Fink’s colleague, Marianne Rosendal, is a member of this group. The 17 member Expert Working Group on Somatic Distress and Dissociative Disorders (S3DWG) is advising on the revision of ICD-10’s Somatoform Disorders. The S3DWG is chaired by Prof Oye Gureje. DSM-5 Somatic Symptom Disorder work group member, Prof Francis Creed, is a member of this group. In 2011, the Primary Care Consultation Group’s proposals for a replacement for the “Unexplained somatic symptoms/medically unexplained symptoms” category were put out for review and evaluation in primary care settings to nine international focus groups* in seven countries . *Austria, Brazil, Hong Kong, New Zealand, Pakistan, Tanzania and United Kingdom. The PCCG anticipated refining their recommendations in the light of focus group responses before progressing to field testing the new disorder. Since any new primary care disorder concept will need to integrate into the ICD-11 core version, one might expect some cross-group collaboration between these two advisory committees. But in their respective 2012 journal papers, the groups presented divergent constructs and neither group refers to the work being undertaken by the other group, or sets out how the two groups relate to each other, or how the primary care group relates to the overall revision process for the Somatoform Disorders. “3. To provide drafts of the content (e.g. definitions, descriptions, diagnostic guidelines) for somatic distress and dissociative disorder categories in line with the overall ICD revision requirements. It is unclear how ICD-11 Revision is co-ordinating the input from the two groups, that is, will it be the PCCG’s revised recommendations that progress to field testing, this year, and if so, how would a divergent set of proposals, developed in parallel by the S3DWG group, relate to the field testing and to the overall revision of the SDs? Or, will ICD-11 Revision require the PCCG group and the S3DWG group to agree on what to call any proposed, single disorder replacement for six or seven SD categories and to reach consensus over what construct, definition, characteristics and criteria will go forward to ICD-11 field testing, and if so, has consensus now been reached? Field tests are expected to start this year. Currently, there is no publicly available information on the finalized characteristics, diagnostic guidelines, criteria, inclusions, exclusions, differential diagnoses etc. that are planned to be used for the field tests which would provide the level of detail lacking in this Beta draft definition. It has been crafted with sufficient elasticity to allow either group’s construct to be shoehorned into it. ICD-11 Revision is possibly hedging its bets depending on the outcome of its field tests. But the devil’s in the detail and without the detail, it isn’t clear whether this definition describes the construct favoured by the S3DWG in late 2012, or by the PCCG in mid 2012, or a more recent revision by one of the groups, or a compromise between the two. The definition wording is based – in some places verbatim – on the construct descriptions presented in the Gureje, Creed (S3DWG) “Emerging themes…” paper, published in late 2012 . This 2012 paper goes on to say that the S3DWG’s emerging proposals specify a much simplified set of criteria for a diagnosis of Bodily distress disorder (BDD) that requires the presence of: 1. High levels of preoccupation with a persistent and bothersome bodily symptom or symptoms; or unreasonable fear, or conviction, of having an undetected physical illness; plus 2. The bodily symptom(s) or fears about illness are distressing and are associated with impairment of functioning. And that in doing away with the “unreliable assumption of its causality” the diagnosis of BDD does not exclude the presence of depression or anxiety, or of a co-occurring physical health condition. Which is a disorder construct into which DSM-5’s “Somatic Symptom Disorder” (SSD) could be integrated, thus facilitating harmonization between ICD-11 and DSM-5. But without clarification from ICD-11 Revision (or further published papers, reports or sight of the field test protocol) I do not think one can safely extrapolate that it is the current proposals of the S3DWG group that are going forward to field testing, this year, in preference to a construct and criteria favoured by the PCCG group. In mid 2012, the Goldberg led PCCG primary care group was proposing a new term called “Bodily stress syndrome (BSS),” to replace ICD’s primary care category, “F45 Unexplained somatic symptoms.” This single BSS category would also absorb F48 Neurasthenia, which is proposed to be eliminated for ICD-11-PHC. In late 2012, the S3DWG group was proposing to subsume the six ICD-10 categories F45.0 – F45.9, plus F48.0 Neurasthenia, under a single disorder category, but under the disorder name, “Bodily distress disorder” (BDD). So at that point, the two groups differed on what term should be used for this new disorder. What wasn’t explicitly set out in the PCCG’s 2012 paper was whether the group intended to mirror the Fink et al BDS construct to the extent of extending the diagnosis to be inclusive of the so-called “functional somatic syndromes,” FM, CFS and IBS (which are currently discretely coded or indexed within ICD-10 in chapters outside the mental and behavioural disorders chapter). Psychol Assess. 2013 Dec 2. [Epub ahead of print] Bifactor Analysis and Construct Validity of the HADS: A Cross-Sectional and Longitudinal Study in Fibromyalgia Patients. Luciano JV, Barrada JR, Aguado J, Osma J, García-Campayo J. Reading the responses of the focus groups, as reported in the Lam et al paper , it is evident that some focus group participants understood the proposed BSS construct as a diagnosis under which IBS, Fibromylagia and CFS patients could potentially be assigned; though one of the New Zealand focus groups noted there was quite a strong feeling that CFS did not fit the paradigm as well as other [FSS] disorders, particularly when there was a good history of preceding viral infection. Whilst a number of diseases are listed in the PCCG criteria, as proposed in 2012, under “Differential diagnoses,” including multiple sclerosis, hyperparathyroidism, systemic lupus erythematosus and Lyme disease – IBS, Fibromylagia, CFS and ME are omitted from the list of “Differential diagnoses” examples. In June 2013, Prof David Goldberg co-authored a paper: Bodily distress syndrome (BDS): the evolution from medically unexplained symptoms (MUS) in Mental Health in Family Medicine. Co-author, Gabriel Ivbijaro, is Editor in Chief, Mental Health in Family Medicine and a past Chair of the Wonca Working Party on Mental Health. Mental Health in Family Medicine is the official journal of The World Organization of Family Doctors (Wonca) Working Party on Mental Health. I don’t have access to this paper, which is currently embargoed, but it should be free in PMC on June 1, 2014 . This F45 section introduction text has not yet been revised to reflect the proposed dismantling and reorganization of the ICD-10 Somatoform Disorders section for ICD-11. Caveat: The ICD-11 Beta draft is not a static document – it is a work in progress, subject to daily revisions and refinements and to approval by the International Advisory Group for the Revision of ICD-10 Mental and Behavioural Disorders, the ICD-11 Revision Steering Group, and WHO classification experts. Proposals for some new or revised disorders may be subject to re-evaluation and revision following ICD-11 field testing. 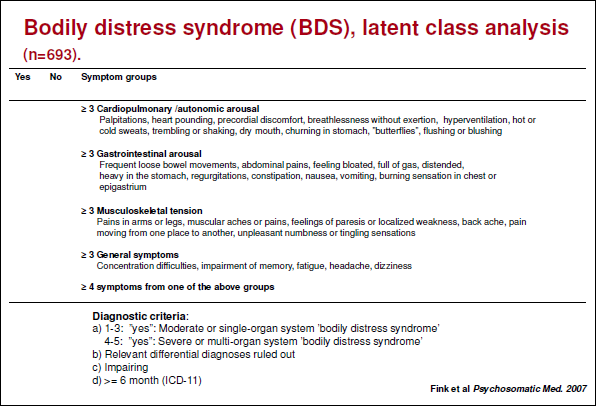 Per Fink and colleagues are lobbying for their “Bodily Distress Syndrome” (BDS) construct to be integrated into forthcoming classification systems and adopted as a diagnosis by primary care practitioners. They propose the reclassification of the somatoform disorders, pain disorder, neurasthenia and the so-called functional somatic syndromes, including fibromyalgia (FM), irritable bowel syndrome (IBS) and chronic fatigue syndrome (CFS), under a single, unifying diagnosis, “Bodily Distress Syndrome,” already in use in clinical and research settings in Denmark. G Ivbijaro is Editor in Chief, Mental Health in Family Medicine and a past Chair of the Wonca Working Party on Mental Health. D Goldberg chairs the Primary Care Consultation Group (PCCG) leading the development and field testing of the next ICD primary care classification (ICD-11-PHC). There are two WHO convened working groups charged with making recommendations for the revision of ICD-10’s Somatoform Disorders: the Primary Care Consultation Group (known as the PCCG) and the Expert Working Group on Somatic Distress and Dissociative Disorders (known as the S3DWG). The revision of ICD-11 is being promoted as an open and transparent process. But to date, neither working group has published progress reports for stakeholder consumption and neither group has published its emerging proposals in public access journals. Content populated in the public version of the ICD-11 Beta drafting platform sheds little light on proposals. Consequently, there is considerable confusion around what is being recommended for the revision of ICD-10’s Somatoform Disorders, whether consensus between the two working groups has been reached, and what proposals will progress to field testing during the next two years. ICD-11 Revision has been asked to clarify when it intends to define and characterize its current proposals within the Beta drafting platform. The notes below set out some of what is known about the two working groups’ emerging proposals, how they diverge and how they compare with DSM-5’s Somatic Symptom Disorder and with Fink et al’s Bodily Distress Syndrome. Caveat: the proposals of the two ICD-11 working groups may have undergone revision and refinement since emerging proposals were published, in July and December, last year; the two groups may or may not have reached consensus over how this proposed new ICD construct should be defined and characterized, its inclusions, exclusions and differential diagnoses, or what name it should be given. What is Bodily Distress Syndrome (BDS)? Bodily Distress Syndrome is the name given to a disorder construct developed by Per Fink and colleagues, Aarhus University, that is already in use in Danish research studies and in clinical settings . Per Fink and colleagues are lobbying for BDS to be integrated into forthcoming classification systems and adopted as a diagnosis by primary care practitioners. Their proposal is for reclassifying somatoform disorders, pain disorder, neurasthenia and the so-called functional somatic syndromes, including fibromyalgia, irritable bowel syndrome and chronic fatigue syndrome, under a new classification, Bodily Distress Syndrome. They consider these should be treated and managed as subtypes of the same disorder with CBT, GET, “mindfulness therapy” and in some cases, antidepressants. The PDF format slide presentation in reference  will give an overview of BDS and there is more information and links in an earlier post, in reference . Is Fink et al’s Bodily Distress Syndrome construct the same as DSM-5’s SSD? No, Bodily Distress Syndrome is a different construct to DSM-5’s Somatic Symptom Disorder. Psychological or behavioural characteristics, central for the diagnosis of SSD, do not form part of the BDS criteria. Cardiopulmonary/autonomic arousal; Gastrointestinal arousal; Musculoskeletal tension; General symptoms. There is a “Modest” BDS (single-organ type) and a “Severe” BDS (multi-organ type). If the symptoms are better explained by another disease, they cannot be labelled BDS. The graphic below compares mutli-organ Bodily Distress Syndrome with Somatic Symptom Disorder, as the DSM-5 draft criteria had stood, in May 2012. Note the defining characteristics of the DSM-5 SSD construct: the SSD definition calls for positive psychobehavioural characteristics (excessive or maladaptive responses or associated health concerns) in response to persistent distressing somatic symptoms; the requirement that the symptoms are “medically unexplained” is not central to the diagnosis and the symptoms may or may not be associated with a well-recognised medical condition. The SSD diagnosis can be made in the presence of one or more unspecified, somatic symptoms associated with general medical conditions and diagnosed disease, like multiple sclerosis, cancer, diabetes or angina, or in the so-called “functional somatic syndromes” (for example, IBS, CFS or fibromyalgia) or in complaints with unclear etiology. This report should be read in conjunction with the caveats at the end of the post, on Page 3. The technical work associated with the preparation of ICD-11, the field testing and trials evaluation will need to be completed next year if WHO is going to meet its target of presenting ICD-11 for World Health Assembly approval in May 2015, with pilot implementation by 2016. Three distinct versions of the ICD-11 classification of Mental and Behavioural Disorders are under development: an abridged version for use in primary care, a detailed version for use in specialty settings and a version for use in research. The ICD-10 Somatoform Disorders are under revision for all three versions and the primary care and speciality versions are being developed simultaneously. ICD10-PC, the abridged version of ICD, is used in developed and developing countries and in the training of medical officers, nurses and multi-purpose health workers. Globally, more than 90% of patients with mental health problems are managed by practitioners or health workers in general medical or primary care settings – not by psychiatrists. Over 400 mental disorders are classified in the speciality version of ICD-10 Chapter V. These are condensed to 26 mental disorders for the primary care version – a list can be found on Page 49 of this book chapter, in Table 2.4. Each disorder in ICD10-PC provides information on patient presentation, clinical descriptions, differential diagnoses, treatments, indications for referrals and information sheets for patients and families. A revised list of disorders proposed for inclusion in the forthcoming ICD-11-PHC can be viewed on Page 51, in Table 2.5 . For new and revised disorders included in the primary care version there will need to be an equivalent disorder in the core ICD-11 classification. Existing Somatoform Disorders in the core ICD-10 version can be viewed here: ICD-10 Version: 2010 browser: Somatoform Disorders or from Page 129 in The ICD-10 Classification of Mental and Behavioural Disorders, Clinical descriptions and diagnostic guidelines. A chart showing the grouping of the detailed core version categories and the 26 corresponding disorders in ICD10-PC can be found here, see Page 8, for F45 Unexplained somatic complaints and F45 Somatoform disorders (ICD-10): Connections between ICD-10 PC and ICD-10 Chapter V.
Where reports of emerging proposals for ICD-11 have been published by ICD revision working group members, the recommendations within them may be subject to refinement or revision following analysis of focus group studies, external review and multicentre field trials to assess the validity and clinical utility of proposals for application in developed and developing countries, in high and low resource settings and across general, speciality and research settings . Not all proposals for new or revised disorders are expected to survive the field trials. A WHO Primary Care Consultation Group (known as the PCCG) has been appointed to lead the development of the revision of ICD10-PC, the abridged classification of mental and behavioural disorders for use in primary care settings. The PCCG is charged with developing and field testing the full set of disorders for inclusion in ICD-11-PHC, for which 28 mental disorders are currently proposed. The PCCG members are SWC Chan, AC Dowell, S Fortes, L Gask, KS Jacob, M Klinkman (Vice Chair), TP Lam, JK Mbatia, FA Minhas, G Reed, and M Rosendal. The PCCG is chaired by Prof, Sir David Goldberg. A WHO Expert Working Group on Somatic Distress and Dissociative Disorders (known as the S3DWG) was constituted in 2011 to review the scientific evidence for, and clinical utility of the ICD-10 somatoform and dissociative disorders; to review proposals for the DSM-5 somatic symptom disorders and dissociative disorders categories and to consider their suitability or not for global applications; to review proposals and provide draft content for the somatic distress and dissociative disorder categories in line with the overall ICD revision requirements; to propose entities and descriptions for the classification of somatic distress and dissociative disorders for use in diverse global and primary care settings. External reviewers are also consulted on proposals and content. The full S3DWG membership list is not publicly available but the group is understood to comprise 17 international behavioural health professionals, of which Prof Francis Creed is a member. The S3DWG is Chaired by Prof Oye Gureje. Responsibilities of ICD-11 working groups are set out on Page 3 (1.1.) of document  in the References. Document  also includes information on the ICD-11 field trials, from Page 8 (4. ).